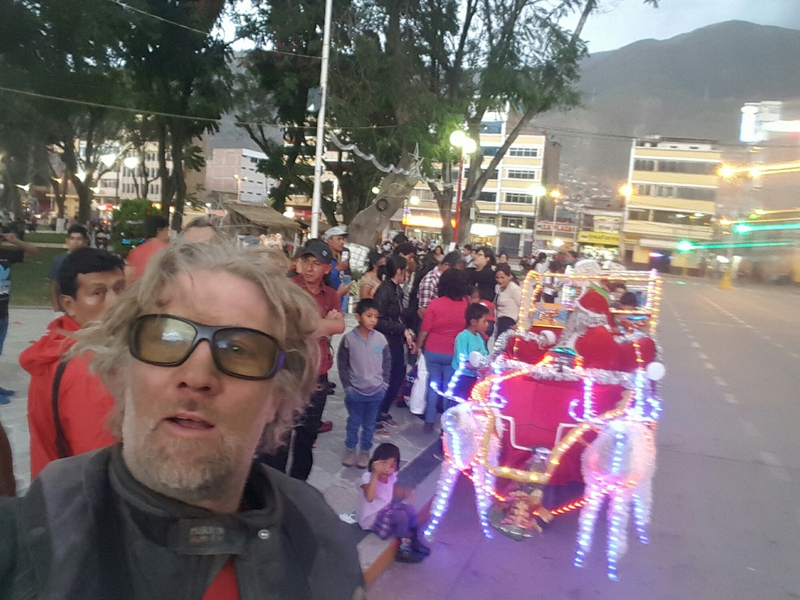 We spent Christmas day riding toward huanuco, most of that was off road. We got as far as the town of Masin and decided it was a great scenic are to stay the night. We got a hotel but needed to find parking for the bikes. The hotel guy found us a spot a couple doors down at another hotel. While the as we were unloading the bikes the family which runs the hotel asked if we wanted a drink with them, we were tired and it sounded good. The family was not gathered for christmas but rather for their dad’s birthday. So we drank Peruvian style, pass a bottle and one glass around for everyone to share.i pour a glass, hand you the bottle and then drink the glass and hand you the glass, and that goes round and round, the grandmother insisted either I or maxxx dance with her to the music coming from the car parked next to us. Neither of us are dancers, but I didn’t want to disappoint to she and I danced solo to about half a song, she was happy. I had to get a shot with Santa on Christmas day. Maxxx wasn’t having any of it. He was tired and just wanted a hotel room.party pooper.